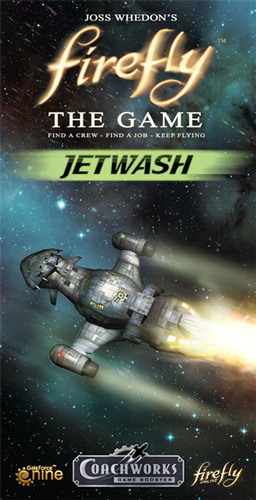 The Firefly: The Game – Jetwash Coachworks game booster adds a new Series IV Firefly to Firefly: The Game. Named for the late Hoban Washburne and built on the newer Series IV Firefly chassis, the Jetwash befits its namesake: fast, with plenty of tricks up its sleeve. A Coachworks game booster contains everything players need to add a new ship to Firefly: The Game. 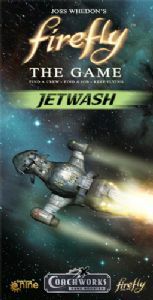 The Jetwash set contains a new Firefly Series IV model (yellow-green); ship card; color-coordinated ship dice (yellow-green); a drive core card; new ship upgrades; a new Leader crew card; sheet of game tokens; a new Set Up Card; and a new Story Card. Explore the Rim on the outskirts of the 'Verse, pickings are good out there, but then that's because the dangers are higher. 25 new cards, with new crew, new jobs and some shiny new gear! So get your crew together and start making so money! The Firefly: The Game – Esmeralda Coachworks game booster adds a new Series IV Firefly to Firefly: The Game. The second Rim Space Expansion set for Firefly: The Game, Kalidasa adds a massive star system to the 'Verse with loads of new opportunities for adventure and profit. The first full expansion for Firefly and there is a heavy dose of player-verses-player action and two new ships to boot! The television show finally hits the boardgame arena. Take your ship and crew and do just what you do best, any job that pays! Can you undercut the opposition, or just 'earn' that bit more commission? Gettin' the job done just got more interesting. Add 40 New Cards to the Misbehave deck for even more criminal exploits!